To some degree, the AAF playoff race has started to take center stage. However, Week 7 is when things really begin to ramp up. In three of the next four weeks, these eight teams will play in key divisional games. With so little separation between seven of the eight teams, there's still a lot of cloudiness about how this could all unfold. And depending on how things go this weekend, things could get a little clearer, or the race could get even tighter. Drama is building and the best football is being played now. Here's everything you need to enjoy Sunday's two AAF games in Week 7. San Diego at Arizona: Don't be surprised if this is the best game of the weekend, and there are no shortage of storylines. Arizona ended its three-game losing streak in the most improbable way by upsetting Orlando. San Diego, meanwhile, lost a heartbreaker to Birmingham by way of a walk-off field goal. There's not much room for a hangover game for either side. Both teams are pressed in the middle of the West division standings at 3-3. Overall, there's not much separating these two. Both rank in the top four in points per game and allow about 20 points per game on defense. On paper, this is the most evenly-matched game of the weekend, and both sides have a propensity for frantic endings worthy of the #AAFterDark hashtag. Birmingham at Memphis: Face it, you're here for Johnny Manziel, aren't you? It's okay to be interested. I am. Now, will he start? The Express were in need of a quarterback, but coming in and starting right away in Week 7 is no easy task and there's a lot of personal growth necessary for Manziel as well. 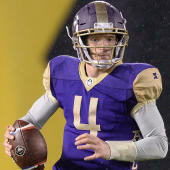 Still, the people will want to see the biggest name to sign with the AAF, regardless of the outcome. Speaking of quarterbacks, the Iron have an interesting situation on their hands as well. One week after coming off the bench, Keith Price was knocked out of the game early against San Diego. That put Luis Perez back under center and he looked like a different quarterback. He was slinging it deep and dropping some dimes, totaling 359 yards and three touchdowns. He also threw two ill-advised interceptions and nearly turned the ball over a couple more times. He probably still gives this team the best chance to win, he just has to harness some of those poor decisions.